The idea that Kryptonians are basically gods among men is nothing new for Superman. The comics have returned time and again to the idea that someone who possesses the powers of a Superman or Supergirl would inevitably be worshipped as higher beings, the same way Jesus is for Christians—or L. Ron Hubbard is for morons. But when it comes to the onscreen, live-action iterations of those characters, there are markedly few examples of that theme playing out. And in terms of handling the subject deftly, it took Supergirl all of 45 minutes last night to one-up Batman V Superman: Dawn Of Justice. The episode “The Faithful” goes back to the very beginning of the show, revisiting the accident that leads to Kara revealing her existence to the world—here from the point of view of the man she saved from certain doom. That man, Thomas Coville, saw Supergirl’s intervention as a divine act, proof that the world was being watched over by a higher power. He creates a religion around Kara, adapting the preexisting Kryptonian mythology of Rao and twisting it into a faith that vaunts Supergirl as the savior of all humanity. His followers are so devout, they begin deliberately putting themselves in life-threatening situations, blindly trusting that Kara Zor-El will show up to make it all okay. He starts a cult, in other words, and part of what makes “The Faithful” so great is the ways it examines just how nebulous the line between “cult” and “religion” can be. As Caroline Siede notes in her review, Supergirl also managed to interrogate the notion of superheroes-as-gods in a manner that’s consistent with the comics (its better-written installments, anyway) by stressing the ambiguity of faith: “Though it can be used for corrupt purposes, faith itself isn’t inherently good or bad.” It’s an age-old philosophical theme, but one the show handles with depth and sensitivity. Granted, Supergirl has struggled with its writing. It can be smart, but it’s rarely subtle; the show tends to approach things in stark black-and-white. But “The Faithful” is surprisingly nuanced, and it’s far and away the best exploration of those religious ideas posed by Superman/Supergirl that we’ve seen in a a live-action DC film or show. And it puts to shame their rather facile investigation in both Man Of Steel and Batman V Superman. Like “The Faithful,” both of those films are ostensibly about the way the existence of a Superman alters humankind’s understanding of itself and its place in the universe. Man Of Steel, at least, implies a deeper understanding of the difficult existential questions raised by Kryptonians on Earth, with its fleeting discussions about the nature of power vs. belief and by showing the religious devotion inspired by someone more than human, with powers beyond mortal comprehension. But those brief moments of profundity are little more than window dressing, vague narrative feints that tease far more depth than they convey. Strip away the Jesus Christ poses Snyder lavishes on his iconography-obsessed film, and it’s really just another story about fathers and sons. In Snyder’s Batman V Superman, the religious imagery and Christ allusions are even more blatant, and even more bluntly delivered. The brief shot of people reaching out for Superman like he’s a super-powered pope, or “False God” graffiti tagging his statue, are only symbols for a larger conversation the film never actually has. It’s why its many defenders in Reddit threads tend to have far more interesting takes on the movie’s philosophy than Batman V Superman itself. Sure, Snyder throws out plenty more religious iconography and a few rambling Lex Luthor monologues about it, but the theological conflict posed by Superman’s existence never gets the direct, thoughtful address the movie believes it’s presenting. Where Supergirl gets it right is in actually letting Kara’s worshippers open their mouths. Thomas Coville and his flock express their beliefs and the reasoning behind why they do what they do—including putting other people’s lives in danger—and then others actually discuss the morality behind their actions. 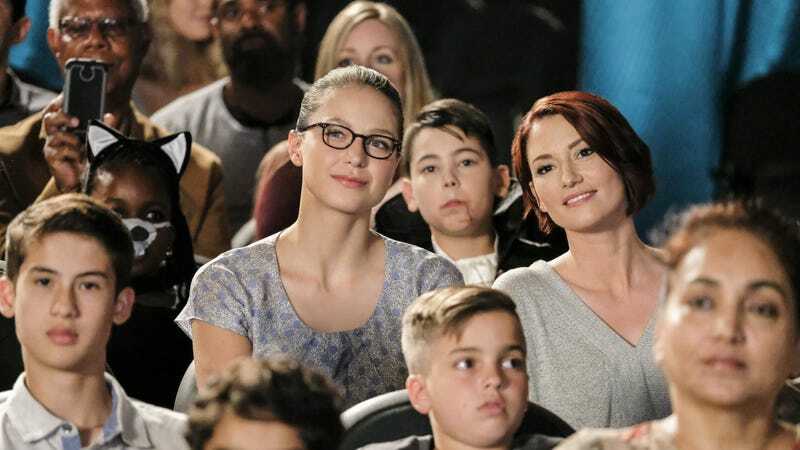 By exploring their fanatical devotion to Kara, and their belief that they’re doing the right thing by helping others turn their lives over to a higher power, it opens a larger debate about the nature of religion itself. It’s a nuanced discussion, one Supergirl handles with grace, and it does so in one-third the time. Granted, not everything needs to be spelled out for every viewer. Some fans undoubtedly even prefer the purely symbolic approach. But Snyder’s Superman films clearly want to be about having those larger philosophical discussions, even though they spend most of their time just talking around it. Here’s hoping Superman’s future big-screen outings take a cue from his distaff TV cousin, and put as much work into their overarching philosophy as Supergirl did in a single episode.